At Cluck U, we want you to have actual facts, not "alternate facts." Read on to test your chicken and egg knowledge. At Cluck U we believe knowledge is the key to freedom. Can't even tell you how many heartbreaking photos we had to look through to find one to put here that wasn't totally upsetting. Please, google away though. Be our guest. People need to see. are killed per year, for the egg industry. Ground up - alive - in grinders or suffocated in garbage bags. It sounds like a horror movie... like something no decent human being or society could possibly dream up, let alone sanction... but this is carried out by a lot of people, a lot of corporations, a lot of boards and CEO's... as long as you keep buying them, they have no problem keeping this nightmare show up and running. 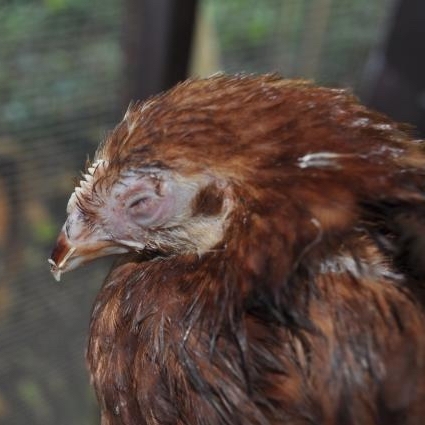 This is the egg industry, and this is happening in facilities all over the world. Why? Because those male birds won't ever lay eggs. To business, they are not worth the cost of feed and housing. They are ground up and sold to other industry... commonly, the "bone meal" you see listed in the contents of bags of potting soil. They won't show you this in the happy art-directed pictures of chickens on grass in front of red barns. This is not cool, right? We aren't being unreasonable here, to say that grinding up and killing little baby chicks by the millions is completely not okay and totally horrific... don't you agree? It took years and years of advertising to make people think eggs are no problem for chickens to lay. YOU THINK EGGS ARE "natural"
Believe us: nature had NO HAND in creating a bird that is forced to lay an egg per day on average. Domesticated chickens have been forced by breeding to lay 250-300 eggs per year. The effect on their bodies is hellish. Imagine if a human had to give birth nearly once a day. You aren't anywhere near the coop to hear the screaming, see the mouth breathing and stress of a hen's labor, or collect her weak body when an egg breaks inside of her because she hasn't the strength to push one more out, or her body is not able to produce enough calcium to create shell. And there is no coop, anyway - for billions of birds, it is a windowless, airless, sunless factory. Today's Extra Credit Question: How many eggs does the most prolific bird in NATURE, in the wild, lay per year? The answer is kind of shocking: 12-15. That's right... and that bird was the modern chicken's ancestor, Wild Red and Wild Grey Jungle Fowl. Nature did not put on this planet one single bird who lays more eggs than that in one year. But humans worked hard to make something sinister a reality: they manipulated through breeding, rigged lighting to fake faster cycles of day and night, they added hormones to feeds... and over the years they managed to create birds that lays 10 times the number of eggs they were meant to - - at a terrible toll to each hen’s health, well-being and life. At just two years old, she is called "a spent layer" by industry, and they are sent to slaughter. Note: This is only the second fact on this page but by now, you should be getting kind of pissed, and even feel misled and lied to by every single teacher, government subsidized advertising, school and tv commercial you ever saw extolling the supposed greatness of eggs. WHERE DO EGG LAYERS GO WHEN IT IS TIME FOR THEIR RETIREMENT? Sadly, there is no such thing as a happy retirement for chickens or any farm animals. That poor layer hen gets no thanks or special care for all the eggs people have taken from her. She ends up at the slaughterhouse where she is destined to be made into "cheap meat"- nuggets and such, since her body is so spent. 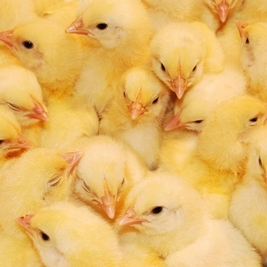 Big lightbulb moment for vegetarians: chickens used for eggs still end up at the slaughterhouse. They still end up as meat. They have still been exploited. They have still been treated as nothing more than a commodity. Even if they are one of the few out of billions of birds that are rescued and make it to sanctuary like ours, the challenges can be heartbreaking; so many of the birds are dealing with permanent physical challenges and reproductive distress. Their lives are often plagued by ailments and susceptibility to illness, if not outright mutilations and deformities. All too sadly, a bird coming to us is here for only a short time, receiving love and compassion they have never previously known, and being given hospice care. We've all been there - we all were told that eggs and dairy were harmless, and we were all assured the animals "had a good life." It is all just part of the giant con of animal agriculture.